A heart warming and thought provoking qoute, which recognises it's not just the everyday and visible actions of our mums, but also everything that we take for granted that happens for us as if by magic. It's a gift to a special someone, acknowledging what they do matters and whilst we don't always thank them, we know without them the home and family might not run as smoothly. 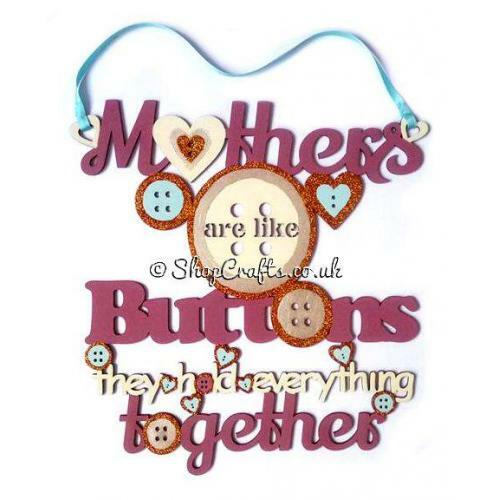 The pictured quote has been painted in creams and vintage pinks, and the buttons have been styled in keeping with those buttons you'd find in the 'button' box something every mum, nan has in her sewing box. Alternatively, you can choose your own colours, and how much or little embellishment is used. Finished with a length of ribbon, this quote can be hung in any room favourable to the recipient. The dimensions of this item is 28cm (L) x 0.3cm (D) x 30cm (H). The hanging length is aproximately 40cm given the variable length of ribbon used. On the reverse side it is left unpainted. This item is a stand alone design, however there is an assortment of other family quotes and phrase which relate to mums, and other family members if you'd like to browse further.